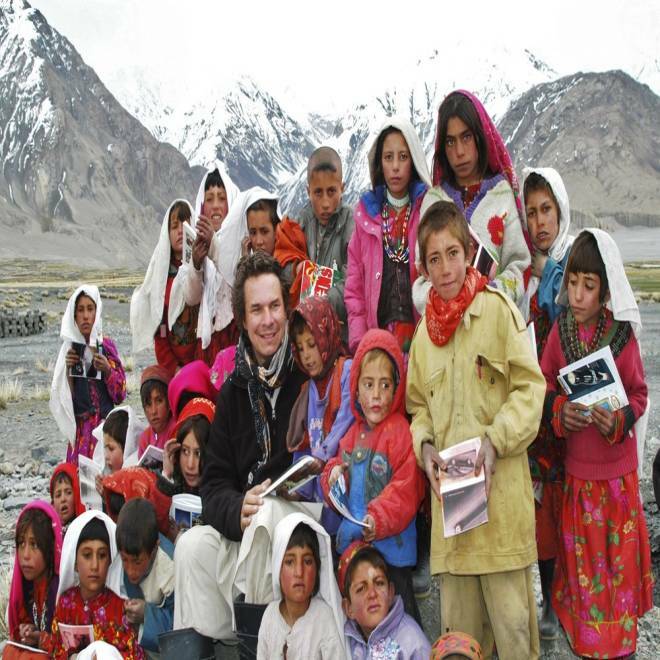 Greg Mortenson, author of "Three Cups of Tea," posed with schoolchildren in Afghanistan. He has come under fire for exaggerating and conflating certain details in his book, and four readers filed suit against him. A federal judge on Monday dismissed a lawsuit against author Greg Mortenson, calling claims "flimsy and speculative" that the humanitarian and his publisher lied in his best-selling "Three Cups of Tea" and "Stones Into Schools" to boost book sales. The civil lawsuit by four people who bought Mortenson's books said they were cheated out of about $15 each because the books were labeled as nonfiction accounts of how Mortenson came to build schools in Central Asia. The lawsuit by four readers from Montana, California and Illinois was filed after "60 Minutes" and author Jon Krakauer reported last year that Mortenson fabricated parts of those books. The plaintiffs said Mortenson, co-author David Oliver Relin, Penguin and Central Asia Institute were involved in a fraud and racketeering conspiracy to build Mortenson into a false hero to sell books and raise money for CAI, the charity Mortenson co-founded. Haddon wrote in his ruling that their racketeering allegations "are fraught with shortcomings" and the plaintiffs' "overly broad" claims that they bought the books because they were supposed to be true aren't supported in the lawsuit. The ruling is good news for Mortenson and his charity after the Montana attorney general earlier in April announced a $1 million agreement to settle claims that Mortenson mismanaged the institute and misspent its funds. The agreement removes Mortenson from any financial oversight and overhauls the charity's structure, but did not address the books' contents. "He stands by his books," said Anne Beyersdorfer, the charity's interim executive director, of Haddon's ruling. Mortenson was on his way to Pakistan on Monday and could not immediately comment, she said. "Three Cups of Tea," which has sold about 4 million copies since being published in 2006, was conceived as a way to raise money and tell the story of his institute, founded by Mortenson in 1996. The book and promotion of the charity by Mortenson, who appeared at more than 500 speaking engagements in four years, resulted in tens of millions of dollars in donations. The book recounts how Mortenson lost his way after a failed mountaineering expedition and was nursed back to health in a Pakistani village. Based on the villagers' kindness and the poverty he saw, he resolved to build a school for them. The lawsuit claimed, as did the Krakauer and "60 Minutes" report, that Mortenson fabricated that story and others in the book and its sequel, "Stones Into Schools." In this April 2011 video, Daniel Borochoff, the president of the American Institute of Philanthropy, talks about the controversy surrounding the book, "Three Cups of Tea," by Greg Mortenson. Morentson has denied any wrongdoing, though he has acknowledged some of the events in "Three Cups of Tea" were compressed over different periods of time. The judge did not address allegations of fabrications, but wrote that the plaintiffs can't simply rely on general allegations of lies in making a claim. In fact, many of the items that the lawsuit lists as lies the defendants made after the books were written, such as CAI paying for Mortenson's expenses and purchasing his books, "do not actually appear to be untruthful or illegal, and are overly vague," Haddon wrote. Haddon also ruled that the plaintiffs can't rewrite their complaint to address those shortcomings, noting that the case has been pending for nearly a year and the lawsuit already has been changed five times. "The imprecise, in part flimsy, and speculative nature of the claims and theories advanced underscore the necessary conclusion that further amendment would be futile," Haddon wrote. Plaintiffs' attorney Zander Blewett did not immediately return a call for comment. The plaintiffs had asked Haddon to order Penguin to account for all the money collected from book sales and refund that money to people who bought the books, with the rest going to a humanitarian organization. The yearlong Montana attorney general investigation found that Mortenson's poor record keeping and personnel management resulted in unknown amounts of cash spent overseas or for management costs without receipts or documentation. CAI's two other board members were Mortenson loyalists who generally did not challenge Mortenson, and he resisted or ignored CAI employees who questioned his practices, the investigative report said. Mortenson also reaped financial benefits at the charity's expense, including the free promotion of his books, and the royalties from thousands of copies the organization bought to donate to libraries, schools, churches and military personnel, the report said. The organization spent more than $2 million on Mortenson's charter flights to speaking engagements, and Mortenson and his family also charged personal items to the charity, according to the report. Beyersdorfer has said Mortenson will remain the face of the charity, but it won't be as executive director and he is barred from being a voting member of the board of directors as long as he still draws a paycheck from CAI.